For a great value Xmas flower delivery in Sydney, this candy cane-inspired posy is the perfect choice! This vibrant flower posy features a cluster of fresh red roses, pure white Singapore orchids and fuzzy lime green dianthus balls. Mixed with luscious green leaves and beautifully gift wrapped, our Christmas flower delivery will add a festive flair to any home over the holiday period. Send this beautiful floral gift just as it is, or team with a fragrant Urban Rituelle candle, chocolate or bottle of wine from our quality range of gift add ons! 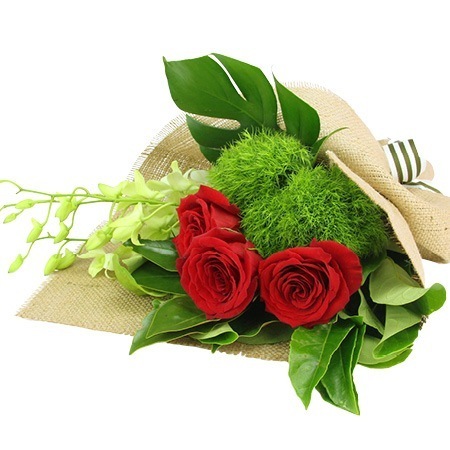 Deliver Xmas flowers Sydney wide by ordering online or call our team on 1800 66 66 46. Our team are leaving lovely floral suprises across the metro region right up until Saturday 23rd December!